Small Batch Coffee has been a cornerstone of Brighton & Hove’s speciality coffee scene for many years. Currently there are seven outlets in Brighton & Hove itself, including two carts (one at Brighton Station, the other at Hove Station), a new roastery in Portslade and the latest branch, just along the coast in Worthing. I’ve always been Small Batch fan, so it’s a bit odd that that I’ve only written up the Norfolk Square branch, and that was four years ago! So, on my return to Brighton at the end of last year, I made a Small Batch visit a priority and where better than where it all started, the original roastery/espresso bar at Goldstone Villas? These days, of course, the roastery is no more, having moved out in September 2017. Instead, you effectively get two coffee shops in one, the old roastery having been converted into the Workspace, designed to attract remote workers, although anyone is welcome to use it. The offering is the same in both: a standard espresso menu using the Goldstone house-blend (or decaf if you prefer), plus a daily option on batch-brew. If you’re hungry, there are pre-prepared sandwiches and cake, with doughnuts on Saturday. I’m rather embarrassed that it’s taken me five years to get back! For those that don’t know, Small Batch occupies a pair of ground-floor units, with flats above, at the left-hand end of a small parade of shops at the northern end of Goldstone Villas, just a stone’s throw from Hove Station. I actually visited back in 2013, when I sat in the espresso bar, interviewing one of the founders, Alan, for Caffeine Magazine #5. From the street, the two parts of Small Batch look almost identical: both have floor-to-ceiling windows on the left, and a glass door on the right, each with a slightly raised outdoor seating area of two four-person tables in front of the windows. A small step leads up to the left-hand door (the old roastery, now the Workspace), while the right-hand door has a long, shallow ramp. You can use either door, but are better off entering on the right, where you’ll find the counter. Both spaces are long and thin, although the layouts are rather different. The coffee shop (right-hand side) has two low four-person tables with stools in the windows to the left of the door, while the counter runs along most of the left-hand wall, ending about ¾ of the way back, leaving space for a doorway through to the Workspace. Beyond this, projecting from the back wall, is a long, thin, high three-person table. Four sets of tall, four-person tables with high, low-backed chairs line the right-hand wall. The first set, a little way back from the door, is narrower than the others, which are equally spaced along the wall, the final set opposite the doorway through to the Workspace. Right at the back, against the back wall, is the retail selection, where you can buy coffee kit and beans. The counter is logically laid out, cakes and sandwiches first, forcing you to file past on the way to the till, where you order. Next comes a pair of grinders (decaf and house-blend), followed by the four-group La Marzocco FB80 espresso machine. Finally, at the end, an open space allows you to wait if you’ve ordered takeaway. The Workspace, on the other side, is effectively an extension of the coffee shop, but fitted out for working on laptops, etc. Each space has its own (free) Wi-Fi network, but only the Workspace has power, attracting laptop/remote workers during the week, but acting more as overflow seating at the weekends. The Workspace is split into two, with front and rear sections separated by a tall shelving unit which extends from the left-hand wall to about ¾ of the width of the Workspace. A three-person window-bar is to the left of the door, followed by an L-shaped arrangement of three four-person tables along left-hand wall and the front of the shelves. At the back, there’s a long, communal table down the middle with 10 seats, five per side, with three two-person high square tables with stools against left-hand wall. You can head through the doorway at the back to order at the counter, or, if you don’t want to leave your laptop, you can flag down a passing barista. I was there on the last Saturday before Christmas, when it was relatively quiet. I enjoyed a double espresso of the Goldstone blend, which is blessed with a traditional espresso profile. This was just as well since I paired it with a very lovely raspberry doughnut. Light and fluffy, stuffed full of raspberry jam, it was very sweet, and I fear a more subtle espresso blend wouldn’t have stood up to it at all well! Liked this? Then take a look at the rest of Hove’s speciality coffee scene with the Coffee Spot Guide to Brighton & Hove. 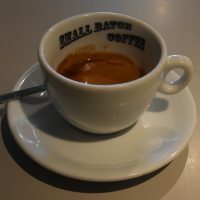 This entry was posted in Brighton & Hove, Cafe/Roaster, Cafes, Cake, Coffee Terraces, Laptop Friendly, Retailers, Sandwiches and tagged include, Small Batch by Brian Williams. Bookmark the permalink.